TradeStation caters to both institutional and retail traders and prides itself on its international reach, being accessible to traders throughout the world. It is a self-clearing platform for equities, options and futures. This means that you can open and close positions directly through the platform itself. 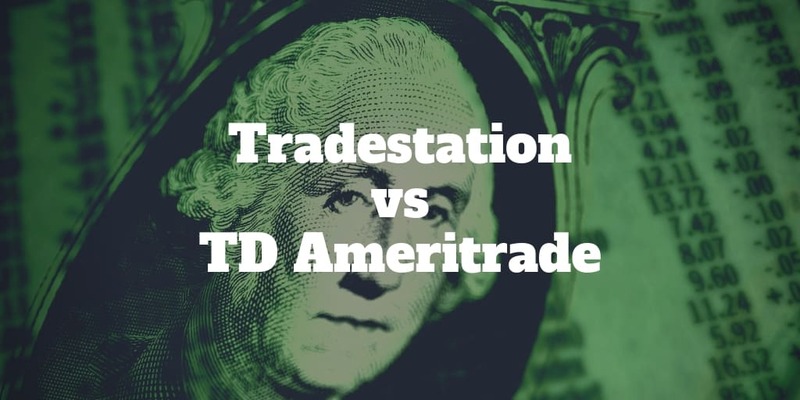 When we compare TradeStation vs TD Ameritrade, the latter has separate online portals for retail and institutional investors. It is known for its thinkorswim trading platform, where you can buy and sell equities, commodities and options. Which Broker Is Best For You? Beyond stocks, futures, and options, TradeStation allows you to invest in a variety of products, including municipal bonds and dividend reinvestment plans (DRIPs). It is even possible to buy certificates of deposit (CDs), which may be helpful if you are looking to build a balanced or more conservative portfolio. You can also have stock purchases directly routed to the exchange of your choice, which may help speed up the process of buying or selling. TD Ameritrade allows you to connect directly with investment advisers who will provide insight into the types of investments that are best for your needs. Via its Essential Portfolios offering, the company will also create a portfolio on your behalf based on the information that you have provided. Once your plan has been created, you can track its progress in real time and make changes as you desire. These capabilities are in addition to TD Ameritrade providing real-time data that you can access through its thinkorswim platform. If you are interested in learning more about investing or different investment types, the company provides instructional webinars and other online content. These broadcasts are suitable for all investors regardless of their skill levels or experience. You will be charged $5 per transaction to buy or sell a stock at TradeStation. Options contracts cost 50 cents plus the $5 transaction fee; however, futures contracts are $1.50 to both open and close a transaction. Alternate price structures are available for those who trade in extremely small or extremely large quantities. These are explained in detail on the TradeStation website. TradeStation has a variety of fees related to equities and futures accounts. For instance, there is a $25 returned check fee for each type of account. There is also a $25 wire fee for domestic accounts and a $35 wire fee for international accounts. Account service fees are $99.95 a month with an additional $50 yearly fee if an account is inactive. If you need help with a transaction, that assistance will carry a fee of $50. Margin interest rates range from 3 to 9% based on your account size. Stock trades range from $6.95 when you do them yourself online to $44.95 when the trade is executed with the help of a broker. For options trades, add 75 cents per contract plus $19.99 if an option is assigned or exercised. Stock-exchange traded funds (ETFs) have the same commission structure as stocks unless the transactions are specifically labeled as commission-free. You can trade load or no-transaction fee (NTF) mutual funds for free, and no-load funds are $49.99 per trade. Fees may apply for forex transactions, and margin requirements on forex trades start at $200. Other fees and margin rates can be found on the TD Ameritrade website. TradeStation charting tools are available for smartphones, desktop browsers and tablets. The company prides itself on its use of analytics to help you make the best possible trade. 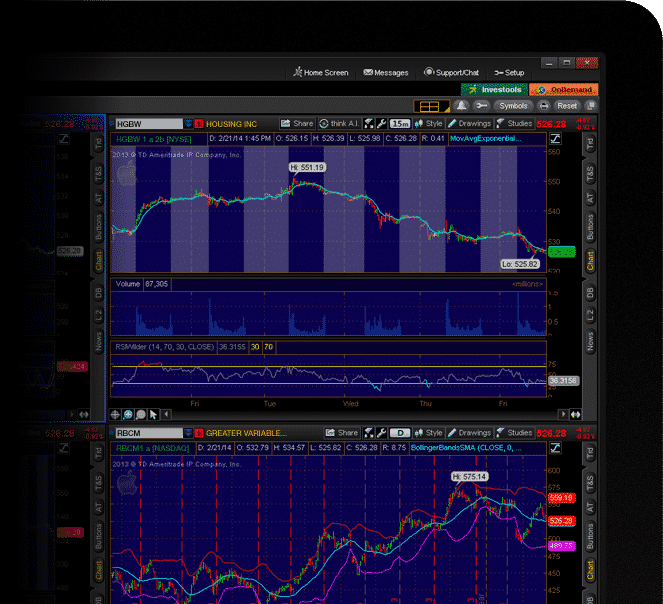 Its RadarScreen tool helps you determine the best time to enter and to exit a trade. If you like to buy and sell options, the OptionStation Pro feature may help you make better decisions based on current and historic trade data. Through the TradeStation developer center, you can even make apps or other programs that customize your trading experience. You can choose to make these programs on your own or with help from the TradeStation team. Fees may apply to use this service, and you may also need to brand the app with the TradeStation colors and logo. TD Ameritrade makes it as easy as possible to define and achieve your investment goals. Through the thinkorswim platform, you can find news updates, real-time market data and historical data to help make investment decisions. You can also run simulations to determine how an investment may play out over the short- and long-term. This tool is available for smartphones, desktops and tablets. The thinkorswim platform is unique in the fact that it offers trade ideas via social signals gathered from Twitter. You can also join trader communities through thinkorswim that make it easier to obtain ideas from veteran users or get feedback about your own ideas. Both TradeStation and TD Ameritrade allow you to trade thousands of stocks using both market and limit orders. Routing technology is used by both to make it possible to get the best price currently available. Furthermore, both allow for trading on Pink Sheet stocks, which are usually smaller or less liquid securities. Both companies allow you to trade options, and they offer a variety of ways to analyze and execute trades. Whether you use TD Ameritrade or TradeStation, you will be limited to four legs per option transaction. You can trade options on both securities and indexes using either TradeStation or TD Ameritrade. There are no trade minimums, and you will not have to pay a fee to access the information used to buy or sell such a product with either company. While both establishments offer load and no-load mutual funds, TD Ameritrade has more available options in both of these fund categories. There are 8,049 no-load funds to choose from through TD Ameritrade compared to just 1,008 such funds available with TradeStation. TradeStation does not offer any commission-free ETFs whereas TD Ameritrade offers almost 300. While it doesn’t have any ETFs without commissions, TradeStation does offer many different ETF products aimed at meeting your specific investment needs. This type of product is subject to day-trading and margin rules. TD Ameritrade offers around 100 ETFs via reputable firms such as Vanguard and iShares. Municipal, government and treasury bonds can be effective ways to gain passive income while minimizing income taxes. TD Ameritrade and TradeStation both make it easy to buy all three types of bonds. TD Ameritrade allows you to trade forex from 6 p.m. on Sunday until 3:30 p.m. on Friday. TradeStation does not allow retail or institutional investors to trade forex. There is no account minimum to trade via TD Ameritrade, and there are no minimum deposits when opening an account. However, there is a $50 minimum for those who are looking to fund their accounts through an electronic funds transfer. A $2,000 minimum balance applies for those who have margin accounts, and other criteria may apply for margin traders. TradeStation requires an initial deposit of $500 for stock or options accounts. If you plan on trading futures or futures options, the initial deposit jumps to $5,000. A minimum balance of $2,000 is required for margin stock or stock options accounts. TradeStation offers accounts for individuals as well as joint and custodial accounts for minors. It is also possible to open an IRA through TradeStation to help save for your retirement. Those who own an LLC or who operate a business as a sole proprietor can create an account in the name of their companies. If you are interested in creating a trust for estate planning purposes, you can do so through TradeStation. TD Ameritrade offers a variety of individual, retirement and entity accounts. Small business owners can setup a SIMPLE or SEP IRA in addition to a Solo 401(k). These business owners can also create accounts in the name of their sole proprietorship or LLC. Entity accounts are also ideal for investment clubs or for those who are looking to create trusts or other specialized accounts. TradeStation makes it easy to get in touch with its customer support staff. You can choose to contact support by phone, through email or via online chat. It is also possible to request that a TradeStation representative call you at a predetermined time. Support is available for both American and international account holders. TD Ameritrade offers support through a live chat feature as well as by phone or through email. If you have questions about a trade, a support representative can look directly at your chart in an effort to answer them. If necessary, he or she can make a trade on your behalf. You can also get support by visiting a TD Ameritrade branch location or by sending a fax. The apps for both TD Ameritrade and TradeStation sync to your accounts, which means that you can track trades and other information right from your phone. The TD Ameritrade app is available on Google Play, the App Store and the Windows app store. TradeStation’s app is available on Google Play and the App Store. TD Ameritrade comes out on top for investors and traders who don’t want to be nickled and dimed. While both offerings are robust with cutting-edge technology, TD Ameritrade has better customer support and also offers more ETFs and mutual funds at lower costs than TradeStation. The crown jewel in the TD Ameritrade treasure chest is its thinkorswim platform, which is more user-friendly, especially for beginner traders. Ameritrade may also be better for you if you want more flexibility when it comes to saving for retirement thanks to its robo-advisor offering, Essential Portfolios and its network of private wealth managers. If you are looking for flexible pricing options, TradeStation is likely the broker to select.